Not to be confused with Ali Khamenei. For other people named Khomeini, see Khomeini (name). Sayyid Ruhollah Mūsavi Khomeini (Persian: سید روح‌الله موسوی خمینی‎ [ruːhoɫˈɫɑːhe χomeiˈniː] ( listen); 24 September 1902 – 3 June 1989), known in the Western world as Ayatollah Khomeini, was an Iranian politician and marja. He was the founder of the Islamic Republic of Iran and the leader of the 1979 Iranian Revolution that saw the overthrow of the last Shah of Iran, Mohammad Reza Pahlavi, and the end of 2,500 years of Persian monarchy. Following the revolution, Khomeini became the country's Supreme Leader, a position created in the constitution of the Islamic Republic as the highest-ranking political and religious authority of the nation, which he held until his death. He was succeeded by Ali Khamenei on 4 June 1989. Khomeini was born in 1902 in Khomeyn, in what is now Iran's Markazi Province. His father was murdered in 1903 when Khomeini was five months old. He began studying the Quran and the Persian language from a young age and was assisted in his religious studies by his relatives, including his mother's cousin and older brother. Khomeini was a marja ("source of emulation") in Twelver Shia Islam, a Mujtahid or faqih (an expert in Sharia) and author of more than 40 books, but he is primarily known for his political activities. He spent more than 15 years in exile for his opposition to the last Shah. In his writings and preachings he expanded the theory of welayat-el faqih, the "Guardianship of the Islamic Jurist (clerical authority)", to include theocratic political rule by Islamic jurists. This principle (though not known to the wider public before the revolution), was appended to the new Iranian constitution after being put to a referendum. According to The New York Times, Khomeini called democracy the equivalent of prostitution. Whether Khomeini's ideas are compatible with democracy and whether he intended the Islamic Republic to be democratic is disputed. He was Time magazine's Man of the Year in 1979 for his international influence, and Khomeini has been described as the "virtual face of Shia Islam in Western popular culture". In 1982, he survived one military coup attempt. Khomeini was known for his support of the hostage takers during the Iran hostage crisis, his fatwa calling for the murder of British Indian novelist Salman Rushdie, and for referring to the United States as the "Great Satan" and Soviet Union as the "Lesser Satan." Khomeini has been criticized for these acts and for human rights violations of Iranians (including his ordering of execution of thousands of political prisoners, war criminals and prisoners of the Iran–Iraq War). He has also been lauded as a "charismatic leader of immense popularity", a "champion of Islamic revival" by Shia scholars, who attempted to establish good relations between Sunnis and Shias, and a major innovator in political theory and religious-oriented populist political strategy. Khomeini held the title of Grand Ayatollah and is officially known as Imam Khomeini inside Iran and by his supporters internationally. He is generally referred to as Ayatollah Khomeini by others. In Iran, his gold-domed tomb in Tehrān's Behesht-e Zahrāʾ cemetery has become a shrine for his adherents, and he is legally considered "inviolable", with Iranians regularly punished for insulting him. 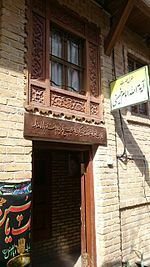 Ruhollah Khomeini's ancestors migrated towards the end of the 18th century from their original home in Nishapur, Khorasan Province, in northeastern part of Iran, for a short stay, to the kingdom of Awadh – a region in the modern state of Uttar Pradesh, India – whose rulers were Twelver Shia Muslims of Persian origin. During their rule they extensively invited, and received, a steady stream of Persian scholars, poets, jurists, architects, and painters. The family eventually settled in the small town of Kintoor, near Lucknow, the capital of Awadh. Ayatollah Khomeini's paternal grandfather, Seyyed Ahmad Musavi Hindi, was born in Kintoor. He left Lucknow in 1830, on a pilgrimage to the tomb of Imam Ali in Najaf, Ottoman Iraq (now Iraq) and never returned. According to Moin, this migration was to escape from the spread of British power in India. In 1834 Seyyed Ahmad Musavi Hindi visited Persia, and in 1839 he settled in Khomein. Although he stayed and settled in Iran, he continued to be known as Hindi, indicating his stay in India, and Ruhollah Khomeini even used Hindi as a pen name in some of his ghazals. There are also claims that Seyyed Ahmad Musavi Hindi departed from Kashmir, instead of Lucknow.Khomeini's grandfather, Mirza Ahmad Mojtahed-e Khonsari was the cleric issuing a fatwa to forbid usage of Tobacco during the Tobacco Protest. Ruhollah Musavi Khomeini, whose first name means "spirit of Allah", was born on 24 September 1902 in Khomeyn, Markazi Province. He was raised by his mother, Hajieh Agha Khanum, and his aunt, Sahebeth, following the murder of his father, Mustapha Musavi, five months after his birth in 1903. Ruhollah began to study the Qur'an and elementary Persian at the age of six. The following year, he began to attend a local school, where he learned religion, noheh khani (lamentation recital), and other traditional subjects. Throughout his childhood, he continued his religious education with the assistance of his relatives, including his mother's cousin, Ja'far, and his elder brother, Morteza Pasandideh. After World War I arrangements were made for him to study at the Islamic seminary in Esfahan, but he was attracted instead to the seminary in Arak. He was placed under the leadership of Ayatollah Abdul Karim Haeri Yazdi. In 1920, Khomeini moved to Arak and commenced his studies. The following year, Ayatollah Haeri Yazdi transferred to the Islamic seminary in the holy city of Qom, southwest of Tehran, and invited his students to follow. Khomeini accepted the invitation, moved, and took up residence at the Dar al-Shafa school in Qom. Khomeini's studies included Islamic law (sharia) and jurisprudence (fiqh), but by that time, Khomeini had also acquired an interest in poetry and philosophy (irfan). So, upon arriving in Qom, Khomeini sought the guidance of Mirza Ali Akbar Yazdi, a scholar of philosophy and mysticism. Yazdi died in 1924, but Khomeini continued to pursue his interest in philosophy with two other teachers, Javad Aqa Maleki Tabrizi and Rafi'i Qazvini. However, perhaps Khomeini's biggest influences were another teacher, Mirza Muhammad 'Ali Shahabadi, and a variety of historic Sufi mystics, including Mulla Sadra and Ibn Arabi. Apart from philosophy, Khomeini was interested in literature and poetry. His poetry collection was released after his death. Beginning in his adolescent years, Khomeini composed mystic, political and social poetry. His poetry works were published in three collections: The Confidant, The Decanter of Love and Turning Point, and Divan. His knowledge of poetry is further attested by the modern poet Nader Naderpour (1929–2000), who "had spent many hours exchanging poems with Khomeini in the early 1960". Naderpour remembered: "For four hours we recited poetry. Every single line I recited from any poet, he recited the next." Ruhollah Khomeini was a lecturer at Najaf and Qom seminaries for decades before he was known on the political scene. He soon became a leading scholar of Shia Islam. He taught political philosophy, Islamic history and ethics. Several of his students – for example, Morteza Motahhari – later became leading Islamic philosophers and also marja'. As a scholar and teacher, Khomeini produced numerous writings on Islamic philosophy, law, and ethics. He showed an exceptional interest in subjects like philosophy and mysticism that not only were usually absent from the curriculum of seminaries but were often an object of hostility and suspicion. Inaugurating his teaching career at the age of 27 by giving private lessons on irfan and Mulla Sadra to a private circle, around the same time, in 1928, he also released his first publication, Sharh Du'a al-Sahar (Commentary on the Du'a al-Baha), "a detailed commentary, in Arabic, on the prayer recited before dawn during Ramadan by Imam Ja'far al-Sadiq", followed, some years later, by Sirr al-Salat (Secret of the Prayer), where "the symbolic dimensions and inner meaning of every part of the prayer, from the ablution that precedes it to the salam that concludes it, are expounded in a rich, complex, and eloquent language that owes much to the concepts and terminology of Ibn 'Arabi. As Sayyid Fihri, the editor and translator of Sirr al-Salat, has remarked, the work is addressed only to the foremost among the spiritual elite (akhass-i khavass) and establishes its author as one of their number." The second book has been translated by Sayyid Amjad Hussain Shah Naqavi and released by BRILL in 2015, under the title "The Mystery of Prayer: The Ascension of the Wayfarers and the Prayer of the Gnostics". His seminary teaching often focused on the importance of religion to practical social and political issues of the day, and he worked against secularism in the 1940s. His first political book, Kashf al-Asrar (Uncovering of Secrets) published in 1942, was a point-by-point refutation of Asrar-e hazar salih (Secrets of a Thousand Years), a tract written by a disciple of Iran's leading anti-clerical historian, Ahmad Kasravi, as well as a condemnation of innovations such as international time zones,[note 1] and the banning of hijab by Reza Shah. In addition, he went from Qom to Tehran to listen to Ayatullah Hasan Mudarris, the leader of the opposition majority in Iran's parliament during the 1920s. Khomeini became a marja' in 1963, following the death of Grand Ayatollah Seyyed Husayn Borujerdi. Most Iranians had a deep respect for the Shi'a clergy or Ulama, and tended to be religious, traditional, and alienated from the process of Westernization pursued by the Shah. In the late 19th century the clergy had shown themselves to be a powerful political force in Iran initiating the Tobacco Protest against a concession to a foreign (British) interest. At the age of 61, Khomeini found the arena of leadership open following the deaths of Ayatollah Sayyed Husayn Borujerdi (1961), the leading, although quiescent, Shi'ah religious leader; and Ayatollah Abol-Ghasem Kashani (1962), an activist cleric. The clerical class had been on the defensive ever since the 1920s when the secular, anti-clerical modernizer Reza Shah Pahlavi rose to power. Reza's son Mohammad Reza Shah, instituted a "White Revolution", which was a further challenge to the Ulama. In January 1963, the Shah announced the "White Revolution", a six-point programme of reform calling for land reform, nationalization of the forests, the sale of state-owned enterprises to private interests, electoral changes to enfranchise women and allow non-Muslims to hold office, profit-sharing in industry, and a literacy campaign in the nation's schools. Some of these initiatives were regarded as dangerous, especially by the powerful and privileged Shi'a ulama (religious scholars), and as Westernizing trends by traditionalists (Khomeini viewed them as "an attack on Islam"). Ayatollah Khomeini summoned a meeting of the other senior marjas of Qom and persuaded them to decree a boycott of the referendum on the White Revolution. On 22 January 1963 Khomeini issued a strongly worded declaration denouncing the Shah and his plans. Two days later the Shah took an armored column to Qom, and delivered a speech harshly attacking the ulama as a class. Khomeini continued his denunciation of the Shah's programmes, issuing a manifesto that bore the signatures of eight other senior Iranian Shia religious scholars. In it he listed the various ways in which the Shah had allegedly violated the constitution, condemned the spread of moral corruption in the country, and accused the Shah of submission to the United States and Israel. He also decreed that the Nowruz celebrations for the Iranian year 1342 (which fell on 21 March 1963) be canceled as a sign of protest against government policies. On the afternoon of 'Ashura (3 June 1963), Khomeini delivered a speech at the Feyziyeh madrasah drawing parallels between the Sunni Muslim caliph Yazid, who is perceived as a 'tyrant' by Shias, and the Shah, denouncing the Shah as a "wretched, miserable man," and warning him that if he did not change his ways the day would come when the people would offer up thanks for his departure from the country. On 5 June 1963 (15 of Khordad) at 3:00 am, two days after this public denunciation of the Shah Mohammad Reza Pahlavi, Khomeini was detained in Qom and transferred to Tehran. Following this action, there were three days of major riots throughout Iran and the deaths of some 400 people. That event is now referred to as the Movement of 15 Khordad. Khomeini was kept under house arrest and released in August. On 26 October 1964, Khomeini denounced both the Shah and the United States. This time it was in response to the "capitulations" or diplomatic immunity granted by the Shah to American military personnel in Iran. The "capitulation" law (or "status-of-forces agreement") allowed members of the U.S. armed forces in Iran to be tried in their own military courts. Khomeini was arrested in November 1964 and held for half a year. Upon his release, he was brought before Prime Minister Hasan Ali Mansur, who tried to convince Khomeini that he should apologize and drop his opposition to the government. When Khomeini refused, Mansur slapped Khomeini's face in a fit of rage. Two months later, Mansur was assassinated on his way to parliament. Four members of the Fadayan-e Islam were later executed for the murder. Khomeini spent more than 14 years in exile, mostly in the holy Iraqi city of Najaf. Initially, he was sent to Turkey on 4 November 1964 where he stayed in Bursa in the home of Colonel Ali Cetiner of the Turkish Military Intelligence. In October 1965, after less than a year, he was allowed to move to Najaf, Iraq, where he stayed until 1978, when he was expelled by then-Vice President Saddam Hussein. By this time discontent with the Shah was becoming intense and Khomeini visited Neauphle-le-Château, a suburb of Paris, France on a tourist visa on 6 October 1978. By the late 1960s, Khomeini was a marja-e taqlid (model for imitation) for "hundreds of thousands" of Shia, one of six or so models in the Shia world. While in the 1940s Khomeini accepted the idea of a limited monarchy under the Iranian Constitution of 1906–07 – as evidenced by his book Kashf al-Asrar – by the 1970s he had rejected the idea. In early 1970, Khomeini gave a series of lectures in Najaf on Islamic government, later published as a book titled variously Islamic Government or Islamic Government: Governance of the Jurist (Hokumat-e Islami: Velayat-e faqih). Since Shariah, or Islamic law, is the proper law, those holding government posts should have knowledge of Sharia. Since Islamic jurists or faqih have studied and are the most knowledgeable in Sharia, the country's ruler should be a faqih who "surpasses all others in knowledge" of Islamic law and justice, (known as a marja'), as well as having intelligence and administrative ability. Rule by monarchs and/or assemblies of "those claiming to be representatives of the majority of the people" (i.e. elected parliaments and legislatures) has been proclaimed "wrong" by Islam. A modified form of this wilayat al-faqih system was adopted after Khomeini and his followers took power, and Khomeini was the Islamic Republic's first "Guardian" or "Supreme Leader". In the meantime, however, Khomeini was careful not to publicize his ideas for clerical rule outside of his Islamic network of opposition to the Shah which he worked to build and strengthen over the next decade. In Iran, a number of actions of the Shah including his repression of opponents began to build opposition to his regime. Cassette copies of his lectures fiercely denouncing the Shah as (for example) "the Jewish agent, the American serpent whose head must be smashed with a stone", became common items in the markets of Iran, helped to demythologize the power and dignity of the Shah and his reign. 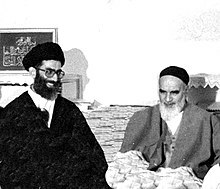 Aware of the importance of broadening his base, Khomeini reached out to Islamic reformist and secular enemies of the Shah, despite his long-term ideological incompatibility with them. After the 1977 death of Ali Shariati (an Islamic reformist and political revolutionary author/academic/philosopher who greatly assisted the Islamic revival among young educated Iranians), Khomeini became the most influential leader of the opposition to the Shah. Adding to his mystique was the circulation among Iranians in the 1970s of an old Shia saying attributed to the Imam Musa al-Kadhem. Prior to his death in 799, al-Kadhem was said to have prophesied that "A man will come out from Qom and he will summon people to the right path". In late 1978, a rumour swept the country that Khomeini's face could be seen in the full moon. Millions of people were said to have seen it and the event was celebrated in thousands of mosques. He was perceived by many Iranians as the spiritual as well as political leader of the revolt. Additionally, the episode with Khomeini's face in the moon showed that in late 1978 he was increasingly regarded as a messianic figure in Iran. As protests grew, so did his profile and importance. Although several thousand kilometers away from Iran in Paris, Khomeini set the course of the revolution, urging Iranians not to compromise and ordering work stoppages against the regime. During the last few months of his exile, Khomeini received a constant stream of reporters, supporters, and notables, eager to hear the spiritual leader of the revolution. Arrival of Khomeini on 1 February 1979. 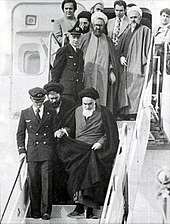 When asked about his feelings of returning from exile in the plane, he replied Hichi; "Nothing"
Khomeini was not allowed to return to Iran during the Shah's reign (as he had been in exile). On 16 January 1979, the Shah left the country (ostensibly "on vacation"), never to return. Two weeks later, on Thursday, 1 February 1979, Khomeini returned in triumph to Iran, welcomed by a joyous crowd estimated (by the BBC) to be of up to five million people. On his chartered Air France flight back to Tehran, he was accompanied by 120 journalists, including three women. One of the journalists, Peter Jennings, asked: "Ayatollah, would you be so kind as to tell us how you feel about being back in Iran?" Khomeini answered via his aide Sadegh Ghotbzadeh: "Hichi" (Nothing). This statement—much discussed at the time and since—was considered by some reflective of his mystical beliefs and non-attachment to ego. Others considered it a warning to Iranians who hoped he would be a "mainstream nationalist leader" that they were in for disappointment. To others, it was a reflection of an unfeeling leader incapable or unconcerned with understanding the thoughts, beliefs, or the needs of the Iranian populace. Khomeini adamantly opposed the provisional government of Shapour Bakhtiar, promising "I shall kick their teeth in. I appoint the government." On 11 February (Bahman 22), Khomeini appointed his own competing interim prime minister, Mehdi Bazargan, demanding, "since I have appointed him, he must be obeyed." It was "God's government," he warned, disobedience against him or Bazargan was considered a "revolt against God." As Khomeini's movement gained momentum, soldiers began to defect to his side and Khomeini declared ill fortune on troops who did not surrender. On 11 February, as revolt spread and armories were taken over, the military declared neutrality and the Bakhtiar regime collapsed. On 30 and 31 March 1979, a referendum to replace the monarchy with an Islamic Republic passed with 98% voting in favour of the replacement, with the question: "should the monarchy be abolished in favour of an Islamic Government?" Although revolutionaries were now in charge and Khomeini was their leader, some opposition groups claim that several secular and religious groups were unaware of Khomeini's plan for Islamic government by wilayat al-faqih, which involved rule by a marja' Islamic cleric. They claim that this provisional constitution for the Islamic Republic did not include the post of supreme Islamic clerical ruler. The Islamic government was clearly defined by Khomeini in his book Hokumat-e Islami: Velayat-e faqih (Islamic Government: Governance of the Jurist) which was published while Khomeini was in exile in 1970, smuggled into Iran, and distributed to Khomeini's supporters. This book included Khomeini's notion of wilayat al-faqih (Governance of the Jurist) as well as the reasoning and in his view, the necessity of it in running an Islamic state. Khomeini and his supporters worked to suppress some former allies and rewrote the proposed constitution. Some newspapers were closed, and those protesting the closings were attacked. Opposition groups such as the National Democratic Front and Muslim People's Republican Party were attacked and finally banned. Through popular support, Khomeini supporters gained an overwhelming majority of the seats in the Assembly of Experts which revised the proposed constitution. The newly proposed constitution included an Islamic jurist Supreme Leader of the country, and a Council of Guardians to veto un-Islamic legislation and screen candidates for office, disqualifying those found un-Islamic. In November 1979, the new constitution of the Islamic Republic was adopted by national referendum. Khomeini himself became instituted as the Supreme Leader (Guardian Jurist), and officially became known as the "Leader of the Revolution." On 4 February 1980, Abolhassan Banisadr was elected as the first president of Iran. Critics complain that Khomeini had gone back on his word to advise, rather than rule the country. On 22 October 1979, the United States admitted the exiled and ailing Shah into the country for cancer treatment. In Iran, there was an immediate outcry, with both Khomeini and leftist groups demanding the Shah's return to Iran for trial and execution. On 4 November, a group of Iranian college students calling themselves the Muslim Student Followers of the Imam's Line, took control of the American Embassy in Tehran, holding 52 embassy staff hostage for 444 days – an event known as the Iran hostage crisis. In the United States, the hostage-taking was seen as a flagrant violation of international law and aroused intense anger and anti-Iranian sentiments. In Iran, the takeover was immensely popular and earned the support of Khomeini under the slogan "America can't do a damn thing against us." The seizure of the embassy of a country he called the "Great Satan" helped to advance the cause of theocratic government and outflank politicians and groups who emphasized stability and normalized relations with other countries. Khomeini is reported to have told his president: "This action has many benefits ... this has united our people. Our opponents do not dare act against us. We can put the constitution to the people's vote without difficulty, and carry out presidential and parliamentary elections." The new constitution was successfully passed by referendum a month after the hostage crisis began. The crisis had the effect of splitting of the opposition into two groups – radicals supporting the hostage taking, and the moderates opposing it. On 23 February 1980, Khomeini proclaimed Iran's Majlis would decide the fate of the American embassy hostages, and demanded that the United States hand over the Shah for trial in Iran for crimes against the nation. Although the Shah died a few months later, during the summer, the crisis continued. In Iran, supporters of Khomeini named the embassy a "Den of Espionage", publicizing details regarding armaments, espionage equipment and many volumes of official and classified documents which they found there. 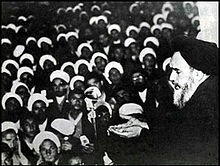 Khomeini believed in Muslim unity and solidarity and the export of his revolution throughout the world. He believed Shia and (the significantly more numerous) Sunni Muslims should be "united and stand firmly against Western and arrogant powers." "Establishing the Islamic state world-wide belong to the great goals of the revolution." He declared the birth week of Muhammad (the week between 12th to 17th of Rabi' al-awwal) as the Unity week. Then he declared the last Friday of Ramadan as International Day of Quds in 1981. Shortly after assuming power, Khomeini began calling for Islamic revolutions across the Muslim world, including Iran's Arab neighbor Iraq, the one large state besides Iran with a Shia majority population. At the same time Saddam Hussein, Iraq's secular Arab nationalist Ba'athist leader, was eager to take advantage of Iran's weakened military and (what he assumed was) revolutionary chaos, and in particular to occupy Iran's adjacent oil-rich province of Khuzestan, and to undermine Iranian Islamic revolutionary attempts to incite the Shi'a majority of his country. In September 1980, Iraq launched a full-scale invasion of Iran, beginning the Iran–Iraq War (September 1980 – August 1988). A combination of fierce resistance by Iranians and military incompetence by Iraqi forces soon stalled the Iraqi advance and, despite Saddam's internationally condemned use of poison gas, Iran had by early 1982 regained almost all of the territory lost to the invasion. The invasion rallied Iranians behind the new regime, enhancing Khomeini's stature and allowing him to consolidate and stabilize his leadership. After this reversal, Khomeini refused an Iraqi offer of a truce, instead demanding reparations and the toppling of Saddam Hussein from power. In 1982, there was an attempted military coup against Khomeini. The Iran–Iraq War ended in 1988, with 320,000–720,000 Iranian soldiers and militia killed. Although Iran's population and economy were three times the size of Iraq's, the latter was aided by neighboring Persian Gulf Arab states, as well as the Soviet Bloc and Western countries. The Persian Gulf Arabs and the West wanted to be sure the Islamic revolution did not spread across the Persian Gulf, while the Soviet Union was concerned about the potential threat posed to its rule in central Asia to the north. However, Iran had large amounts of ammunition provided by the United States of America during the Shah's era and the United States illegally smuggled arms to Iran during the 1980s despite Khomeini's anti-Western policy (see Iran–Contra affair). During war Iranians used human wave attacks (people walking to certain death including child soldiers) on Iraq, with his promise that they would automatically go to paradise—alJanna— if they died in battle, and his pursuit of victory in the Iran–Iraq War that ultimately proved futile. By March 1984, Iran's population had dropped by well over two million. This included an estimated one and a half million that had fled Iran, victims of political executions, and the hundreds of thousands of "martyrs" from Khomeini's bloody "human wave " attacks on Iraq. In July 1988, Khomeini, in his words, "drank the cup of poison" and accepted a truce mediated by the United Nations. Despite the high cost of the war – 450,000 to 950,000 Iranian casualties and USD $300 billion – Khomeini insisted that extending the war into Iraq in an attempt to overthrow Saddam had not been a mistake. In a "Letter to Clergy" he wrote: "... we do not repent, nor are we sorry for even a single moment for our performance during the war. Have we forgotten that we fought to fulfill our religious duty and that the result is a marginal issue?" In an interview with Gareth Porter, Mohsen Rafighdoost, the eight-year war time minister of the Islamic Revolutionary Guard Corps, disclosed how Khomeini had opposed his proposal for beginning working on both nuclear and chemical weapons by a fatwa which had never been made public in details of when and how it was issued. In early 1989, Khomeini issued a fatwā calling for the assassination of Salman Rushdie, an India-born British author. Rushdie's book, The Satanic Verses, published in 1988, was alleged to commit blasphemy against Islam and Khomeini's juristic ruling (fatwā) prescribed Rushdie's assassination by any Muslim. The fatwā required not only Rushdie's execution, but also the execution of "all those involved in the publication" of the book. Khomeini's fatwā was condemned across the Western world by governments on the grounds that it violated the universal human rights of free speech and freedom of religion. The fatwā has also been attacked for violating the rules of fiqh by not allowing the accused an opportunity to defend himself, and because "even the most rigorous and extreme of the classical jurist only require a Muslim to kill anyone who insults the Prophet in his hearing and in his presence." Though Rushdie publicly regretted "the distress that publication has occasioned to sincere followers of Islam", the fatwa was not revoked. 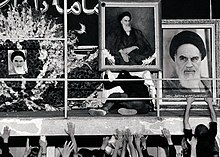 In a speech on 1 February 1979 delivered to a huge crowd after returning to Iran from exile, Khomeini made a variety of promises to Iranians for his coming Islamic regime: a popularly elected government that would represent the people of Iran and with which the clergy would not interfere. He promised that "no one should remain homeless in this country," and that Iranians would have free telephone, heating, electricity, bus services and free oil at their doorstep. Under Khomeini's rule, Sharia (Islamic law) was introduced, with the Islamic dress code enforced for both men and women by Islamic Revolutionary Guards and other Islamic groups. Women were required to cover their hair, and men were not allowed to wear shorts. Alcoholic drinks, most Western movies, and the practice of men and women swimming or sunbathing together were banned. The Iranian educational curriculum was Islamized at all levels with the Islamic Cultural Revolution; the "Committee for Islamization of Universities" carried this out thoroughly. The broadcasting of any music other than martial or religious on Iranian radio and television was banned by Khomeini in July 1979. The ban lasted 10 years (approximately the rest of his life). 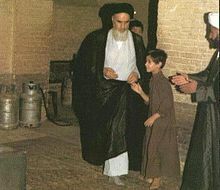 Khomeini is said to have stressed "the spiritual over the material". Six months after his first speech he expressed exasperation with complaints about the sharp drop in Iran's standard of living, saying that: "I cannot believe that the purpose of all these sacrifices was to have less expensive melons." On another occasion emphasizing the importance of martyrdom over material prosperity, he said: "Could anyone wish his child to be martyred to obtain a good house? This is not the issue. The issue is another world." He also reportedly answered a question about his economic policies by declaring that 'economics is for donkeys'. [note 2] This disinterest in economic policy is said to be "one factor explaining the inchoate performance of the Iranian economy since the revolution." Other factors include the long war with Iraq, the cost of which led to government debt and inflation, eroding personal incomes, and unprecedented unemployment, ideological disagreement over the economy, and "international pressure and isolation" such as US sanctions following the hostage crisis. Due to the Iran–Iraq War, poverty is said to have risen by nearly 45% during the first 6 years of Khomeini's rule. Emigration from Iran also developed, reportedly for the first time in the country's history. Since the revolution and war with Iraq, an estimated "two to four million entrepreneurs, professionals, technicians, and skilled craftspeople (and their capital)" have emigrated to other countries. In a talk at the Fayzieah School in Qom on 30 August 1979, Khomeini warned pro-imperialist opponents: "Those who are trying to bring corruption and destruction to our country in the name of democracy will be oppressed. They are worse than Bani-Ghorizeh Jews, and they must be hanged. We will oppress them by God's order and God's call to prayer." However, in 1983, the Central Intelligence Agency (CIA) helped him by providing a list of Soviet KGB agents and collaborators operating in Iran to Khomeini, who then executed up to 200 suspects and closed down the Communist Tudeh Party of Iran. The Shah Mohammad Reza Pahlavi and his family left Iran and escaped harm, but hundreds of former members of the overthrown monarchy and military met their end in firing squads, with exiled critics complaining of "secrecy, vagueness of the charges, the absence of defense lawyers or juries", or the opportunity of the accused "to defend themselves." In later years these were followed in larger numbers by the erstwhile revolutionary allies of Khomeini's movement—Marxists and socialists, mostly university students—who opposed the theocratic regime. Following the 1981 Hafte Tir bombing, Khomeini declared the Mojahedin and anyone violently opposed to the government, "enemies of God" and pursued a mass campaign against members of the Mojahedin, Fadaiyan, and Tudeh parties as well as their families, close friends, and even anyone who was accused of counterrevolutionary behavior. In the 1988 executions of Iranian political prisoners, following the People's Mujahedin of Iran unsuccessful operation Forough-e Javidan against the Islamic Republic, Khomeini issued an order to judicial officials to judge every Iranian political prisoner (mostly but not all Mujahedin) and kill those judged to be apostates from Islam (mortad) or "waging war on God" (moharebeh). Almost all of those interrogated were killed, estimates of their number vary from 1,400 to 30,000. Because of the large number, prisoners were loaded into forklift trucks in groups of six and hanged from cranes in half-hour intervals. Zoroastrians, Jews, and Christians are officially recognized and protected by the government. Shortly after Khomeini's return from exile in 1979, he issued a fatwa ordering that Jews and other minorities (except Bahá'ís) be treated well. In power, Khomeini distinguished between Zionism as a secular political party that employs Jewish symbols and ideals and Judaism as the religion of Moses. Senior government posts were reserved for Muslims. Schools set up by Jews, Christians and Zoroastrians had to be run by Muslim principals. Conversion to Islam was encouraged by entitling converts to inherit the entire share of their parents (or even uncle's) estate if their siblings (or cousins) remain non-Muslim. Iran's non-Muslim population has decreased. For example, the Jewish population in Iran dropped from 80,000 to 30,000. Four of the 270 seats in parliament were reserved for each three non-Muslim minority religions, under the Islamic constitution that Khomeini oversaw. Khomeini also called for unity between Sunni and Shi'a Muslims. Sunni Muslims are the largest religious minority in Iran. making up only 4% of the entire Muslim population. One non-Muslim group treated differently were the 300,000 members of the Bahá'í Faith. Starting in late 1979 the new government systematically targeted the leadership of the Bahá'í community by focusing on the Bahá'í National Spiritual Assembly (NSA) and Local Spiritual Assemblies (LSAs); prominent members of NSAs and LSAs were often detained and even executed. "Some 200 of whom have been executed and the rest forced to convert or subjected to the most horrendous disabilities." the Baha'is are not a sect but a party, which was previously supported by Britain and now the United States. The Baha'is are also spies just like the Tudeh [Communist Party]. After the Shah left Iran in 1979, a Kurdish delegation traveled to Qom to present the Kurds' demands to Khomeini. Their demands included language rights and the provision for a degree of political autonomy. Khomeini responded that such demands were unacceptable since it involved the division of the Iranian nation. The following months saw numerous clashes between Kurdish militia groups and the Revolutionary Guards. The referendum on the Islamic Republic was massively boycotted in Kurdistan, where it was thought 85 to 90% of voters abstained. Khomeini ordered additional attacks later on in the year, and by September most of Iranian Kurdistan was under direct martial law. Mourning men in residence of Khomeini around his seat area, Jamaran, 4 June 1989. Khomeini's health declined several years prior to his death. After spending eleven days in Jamaran hospital, Ruhollah Khomeini died on 3 June 1989 after suffering five heart attacks in just ten days, at the age of 86 just before midnight. He was succeeded as Supreme Leader by Ali Khamenei. Iranians poured out into the cities and streets in enormous numbers to mourn Khomeini's death in a spontaneous outpouring of grief. In the scorching summer heat, fire trucks sprayed water on the crowds to cool them. At least 10 mourners were trampled to death, more than 400 were badly hurt and several thousand more were treated for injuries sustained in the ensuing pandemonium. According to Iran's official estimates, 10.2 million people lined the 32-kilometre (20 mi) route to Tehran's Behesht-e Zahra cemetery on 11 June 1989, for the funeral of Ayatollah Ruhollah Khomeini. Western agencies estimated that 2 million paid their respects as the body lay in state. Yet even here, the crowd surged past the makeshift barriers. John Kifner wrote in The New York Times that the "body of the Ayatollah, wrapped in a white burial shroud, fell out of the flimsy wooden coffin, and in a mad scene people in the crowd reached to touch the shroud". A frail white leg was uncovered. The shroud was torn to pieces for relics and Khomeini's son Ahmad was knocked from his feet. Men jumped into the grave. At one point, the guards lost hold of the body. Firing in the air, the soldiers drove the crowd back, retrieved the body and brought it to the helicopter, but mourners clung on to the landing gear before they could be shaken off. The body was taken back to North Tehran to go through the ritual of preparation a second time. The second funeral was held under much tighter security five hours later. This time, Khomeini's casket was made of steel, and in accordance with Islamic tradition, the casket was only to carry the body to the burial site. In 1995, his son Ahmad was buried next to him. Khomeini's grave is now housed within a larger mausoleum complex. Grand Ayatollah Hussein-Ali Montazeri, a former student of Khomeini and a major figure of the Revolution, was chosen by Khomeini to be his successor as Supreme Leader and approved as such by the Assembly of Experts in November 1985. The principle of velayat-e faqih and the Islamic constitution called for the Supreme Leader to be a marja (a grand ayatollah), and of the dozen or so grand ayatollahs living in 1981 only Montazeri qualified as a potential Leader (this was either because only he accepted totally Khomeini's concept of rule by Islamic jurists,[unreliable source?] or, as at least one other source stated, because only Montazeri had the "political credentials" Khomeini found suitable for his successor). In 1989 Montazeri began to call for liberalization, freedom for political parties. Following the execution of thousands of political prisoners by the Islamic government, Montazeri told Khomeini 'your prisons are far worse than those of the Shah and his SAVAK.' After a letter of his complaints was leaked to Europe and broadcast on the BBC, a furious Khomeini ousted him from his position as official successor. Montazeri was related to Mehdi Hashemi that He was arrested, convicted and executed in September 1987 on charges of counterrevolutionary activities.his portraits were ordered by the then Prime Minister Mir Hossein Mousavi to be removed from offices and mosques. To deal with the disqualification of the only suitable marja, Khomeini called for an 'Assembly for Revising the Constitution' to be convened. An amendment was made to Iran's constitution removing the requirement that the Supreme Leader be a Marja and this allowed Ali Khamenei, the new favoured jurist who had suitable revolutionary credentials but lacked scholarly ones and who was not a Grand Ayatollah, to be designated as successor. Ayatollah Khamenei was elected Supreme Leader by the Assembly of Experts on 4 June 1989. Grand Ayatollah Hossein Montazeri continued his criticism of the regime and in 1997 was put under house arrest for questioning what he regarded to be an unaccountable rule exercised by the supreme leader. According to at least one scholar, politics in the Islamic Republic of Iran "are largely defined by attempts to claim Khomeini's legacy" and that "staying faithful to his ideology has been the litmus test for all political activity" there. Throughout his many writings and speeches, Khomeini's views on governance evolved. Originally declaring rule by monarchs or others permissible so long as sharia law was followed Khomeini later adamantly opposed monarchy, arguing that only rule by a leading Islamic jurist (a marja') would ensure Sharia was properly followed (wilayat al-faqih), before finally insisting the ruling jurist need not be a leading one and Sharia rule could be overruled by that jurist if necessary to serve the interests of Islam and the "divine government" of the Islamic state. Khomeini's concept of Guardianship of the Islamic Jurist (ولایت فقیه, velayat-e faqih) as Islamic government did not win the support of the leading Iranian Shi'i clergy of the time. Towards the 1979 Revolution, many clerics gradually became disillusioned with the rule of the Shah, although none came around to supporting Khomeini's vision of a theocratic Islamic Republic. There is much debate to as whether Khomeini's ideas are or are not compatible with democracy and whether he intended the Islamic Republic to be a democratic republic. According to the state-run Aftab News, both ultraconservative (Mohammad Taghi Mesbah Yazdi) and reformist opponents of the regime (Akbar Ganji and Abdolkarim Soroush) believe he did not, while regime officials and supporters like Ali Khamenei, Mohammad Khatami and Mortaza Motahhari believe Khomeini intended the Islamic republic to be democratic and that it is so. Khomeini himself also made statements at different times indicating both support and opposition to democracy. One scholar, Shaul Bakhash, explains this disagreement as coming from Khomeini's belief that the huge turnout of Iranians in anti-Shah demonstrations during the revolution constituted a 'referendum' in favor of an Islamic republic. Khomeini also wrote that since Muslims must support a government based on Islamic law, Sharia-based government will always have more popular support in Muslim countries than any government based on elected representatives. Khomeini offered himself as a "champion of Islamic revival" and unity, emphasizing issues Muslims agreed upon – the fight against Zionism and imperialism – and downplaying Shia issues that would divide Shia from Sunni. Khomeini strongly opposed close relations with either Eastern or Western Bloc nations, believing the Islamic world should be its own bloc, or rather converge into a single unified power. He viewed Western culture as being inherently decadent and a corrupting influence upon the youth. The Islamic Republic banned or discouraged popular Western fashions, music, cinema, and literature. In the Western world it is said "his glowering visage became the virtual face of Islam in Western popular culture" and "inculcated fear and distrust towards Islam," making the word 'Ayatollah' "a synonym for a dangerous madman ... in popular parlance." This has particularly been the case in the United States where some Iranians complained that even at universities they felt the need to hide their Iranian identity for fear of physical attack. There Khomeini and the Islamic Republic are remembered for the American embassy hostage taking and accused of sponsoring hostage-taking and terrorist attacks, and which continues to apply economic sanctions against Iran. Before taking power Khomeini expressed support for the Universal Declaration of Human Rights. "We would like to act according to the Universal Declaration of Human Rights. We would like to be free. We would like independence." However once in power Khomeini took a firm line against dissent, warning opponents of theocracy for example: "I repeat for the last time: abstain from holding meetings, from blathering, from publishing protests. Otherwise I will break your teeth." Yes, we are reactionaries, and you are enlightened intellectuals: You intellectuals do not want us to go back 1400 years. You, who want freedom, freedom for everything, the freedom of parties, you who want all the freedoms, you intellectuals: freedom that will corrupt our youth, freedom that will pave the way for the oppressor, freedom that will drag our nation to the bottom. In contrast to his alienation from Iranian intellectuals, and "in an utter departure from all other Islamist movements," Khomeini embraced international revolution and Third World solidarity, giving it "precedence over Muslim fraternity." From the time Khomeini's supporters gained control of the media until his death, the Iranian media "devoted extensive coverage to non-Muslim revolutionary movements (from the Sandinistas to the African National Congress and the Irish Republican Army) and downplayed the role of the Islamic movements considered conservative, such as the Afghan mujahidin." Khomeini's legacy to the economy of the Islamic Republic has been expressions of concern for the mustazafin (a Quranic term for the oppressed or deprived), but not always results that aided them. During the 1990s the mustazafin and disabled war veterans rioted on several occasions, protesting the demolition of their shantytowns and rising food prices, etc. Khomeini's disdain for the science of economics ("economics is for donkeys"[note 2]) is said to have been "mirrored" by the populist redistribution policies of former president, Mahmoud Ahmadinejad, who allegedly wears "his contempt for economic orthodoxy as a badge of honour", and has overseen sluggish growth and rising inflation and unemployment. In 1963, Ayatollah Ruhollah Khomeini wrote a book in which he stated that there is no religious restriction on corrective surgery for transgender individuals. At the time Khomeini was an anti-Shah revolutionary and his fatwas did not carry any weight with the Imperial government, which did not have any specific policies regarding transsexual individuals. However, after 1979, his fatwa "formed the basis for a national policy" and perhaps in part because of a penal code that "allows for the execution of homosexuals", as of 2005 Iran "permits and partly finances seven times as many gender reassignment operation as the entire European Union". Khomeini was described as "slim", but athletic and "heavily boned". He's so punctual that if he doesn't turn up for lunch at exactly ten past everyone will get worried, because his work is regulated in such a way that he turned up for lunch at exactly that time every day. He goes to bed exactly on time. He eats exactly on time. And he wakes up exactly on time. He changes his cloak every time he comes back from the mosque. Khomeini was also known for his aloofness and austere demeanor. He is said to have had "variously inspired admiration, awe, and fear from those around him." His practice of moving "through the halls of the madresehs never smiling at anybody or anything; his practice of ignoring his audience while he taught, contributed to his charisma." Khomeini adhered to traditional beliefs of Islamic hygienical jurisprudence holding that things like urine, excrement, blood, wine etc. and also non-Muslims were some of eleven ritualistically "impure" things that physical contact with which while wet required ritual washing or Ghusl before prayer or salat. He is reported to have refused to eat or drink in a restaurant unless he knew for sure the waiter was a Muslim. Khomeini was the first and only Iranian cleric to be addressed as "Imam", a title hitherto reserved in Iran for the twelve infallible leaders of the early Shi'a. He was also associated with the Mahdi or 12th Imam of Shia belief in a number of ways. One of his titles was Na'eb-e Imam (Deputy to the Twelfth Imam). His enemies were often attacked as taghut and Mofsed-e-filarz (corrupters of the earth), religious terms used for enemies of the Twelfth Imam. Many of the officials of the overthrown Shah's government executed by Revolutionary Courts were convicted of "fighting against the Twelfth Imam". When a deputy in the majlis asked Khomeini directly if he was the 'promised Mahdi', Khomeini did not answer, "astutely" neither confirming nor denying the title. As the revolution gained momentum, even some non-supporters exhibited awe, called him "magnificently clear-minded, single-minded and unswerving." His image was as "absolute, wise, and indispensable leader of the nation"
The Imam, it was generally believed, had shown by his uncanny sweep to power, that he knew how to act in ways which others could not begin to understand. His timing was extraordinary, and his insight into the motivation of others, those around him as well as his enemies, could not be explained as ordinary knowledge. This emergent belief in Khomeini as a divinely guided figure was carefully fostered by the clerics who supported him and spoke up for him in front of the people. A whiskey-drinking professor told an American journalist that Khomeini brought pride back to Iranians. A women's rights activist told me that Khomeini was not the problem; it was his conservative allies who had directed him wrongly. A nationalist war veteran, who held Iran's ruling clerics in contempt, carried with him a picture of 'the Imam'. Another journalist tells the story of listening to bitter criticism of the regime by an Iranian who tells her of his wish for his son to leave the country and who "repeatedly" makes the point "that life had been better" under the Shah. When his complaint is interrupted by news that "the Imam" — over 85 years old at the time — might be dying, the critic becomes "ashen faced" and speechless, pronouncing "this is terrible for my country." ... And the electric effect he had on everybody, his charisma, was amazing. You just look at the man and tears come down your cheek. You just look at him and you get tears. I never saw a more handsome old man in my life, no picture, no video, no TV could do justice to this man, the handsomest old man I ever saw in my life was this man. In 1929, Khomeini married Khadijeh Saqafi, the 16-year-old daughter of a cleric in Tehran. By all accounts their marriage was harmonious and happy. She died in 2009. They had seven children, though only five survived infancy. His daughters all married into either merchant or clerical families, and both his sons entered into religious life. Mostafa, the elder son, died in 1977 while in exile in Najaf, Iraq with his father and was rumored by supporters of his father to have been murdered by SAVAK. Ahmad Khomeini, who died in 1995 at the age of 50, was also rumoured to be a victim of foul play, but at the hands of the regime. Perhaps his "most prominent daughter", Zahra Mostafavi, is a professor at the University of Tehran, and still alive. Zahra Eshraghi, granddaughter, married to Mohammad Reza Khatami, head of the Islamic Iran Participation Front, the main reformist party in the country, and is considered a pro-reform character herself. Hassan Khomeini, Khomeini's elder grandson Sayid Hasan Khomeini, son of the Seyyed Ahmad Khomeini, is a cleric and the trustee of the Mausoleum of Khomeini and also has shown support for the reform movement in Iran, and Mir-Hossein Mousavi's call to cancel the 2009 election results. 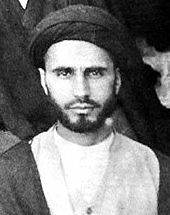 Husain Khomeini (Sayid Husain Khomeini), Khomeini's other grandson, son of Sayid Mustafa Khomeini, is a mid-level cleric who is strongly against the system of the Islamic Republic. In 2003, he was quoted as saying: "Iranians need freedom now, and if they can only achieve it with American interference I think they would welcome it. As an Iranian, I would welcome it." In that same year Husain Khomeini visited the United States, where he met figures such as Reza Pahlavi, the son of the last Shah and the pretender to the Sun Throne. Later that year, Husain returned to Iran after receiving an urgent message from his grandmother. According to Michael Ledeen, quoting "family sources", he was blackmailed into returning. In 2006, he called for an American invasion and overthrow of the Islamic Republic, telling Al-Arabiyah television station viewers, "If you were a prisoner, what would you do? I want someone to break the prison [doors open]. Another of Khomeini's grandchildren, Ali Eshraghi, was disqualified from the 2008 parliamentary elections on grounds of being insufficiently loyal to the principles of the Islamic revolution, but later reinstated. Khomeini was a prolific writer and speaker (200 of his books are online) who authored commentaries on the Qur'an, on Islamic jurisprudence, the roots of Islamic law, and Islamic traditions. He also released books about philosophy, gnosticism, poetry, literature, government and politics. ^ Prior to the International Time Zone system, every locality had its own time with 12 noon set to match the moment in that city when the sun was at its highest point in the sky. This was natural for an era when travel was relatively slow and infrequent, but would have played havoc with railway timetables and general modern long-distance communications. In the decades after 1880 governments around the world replaced local time with 24 international time zones, each covering 15 degrees of the earth's longitude (with some exceptions for political boundaries). I cannot imagine and no wise person can presume the claim that we spared our bloods so watermelon becomes cheaper. No wise person would sacrifice his young offspring for [say] affordable housing. People [on the contrary] want everything for their young offspring. Human being wants economy for his own self; it would therefore be unwise for him to spare his life in order to improve economy [...] Those who keep bringing up economy and find economy the infrastructure of everything -not knowing what human[ity] means- think of human being as an animal who is defined by means of food and clothes[...] Those who find economy the infrastructure of everything, find human beings animals. Animal too sacrifices everything for its economy and economy is its sole infrastructure. A donkey too considers economy as its only infrastructure. These people did not realize what human being [truly] is. ^ DeFronzo 2007, p. 287. "born 22 September 1901..."
^ "History Of Iran Ayatollah Khomeini – Iran Chamber Society". Iranchamber.com. Retrieved 5 January 2013. ^ "Khomeini Life of the Ayatollah By BAQER MOIN". The New York Times. Retrieved 19 January 2012. ^ "Imam Khomeini Official Website | پرتال امام خمینی". harammotahar.ir. Retrieved 9 March 2012. ^ Bowering, Gerhard; Crone, Patricia; Kadi, Wadad; Stewart, Devin J.; Zaman, Muhammad Qasim; Mirza, Mahan, eds. (28 November 2012). The Princeton Encyclopedia of Islamic Political Thought. Princeton University Press. p. 518. ISBN 9781400838554. ^ Malise Ruthven (8 April 2004). Fundamentalism: The Search For Meaning: The Search For Meaning (reprint ed.). Oxford University Press. p. 29. ISBN 9780191517389. ^ Jebnoun, Noureddine; Kia, Mehrdad; Kirk, Mimi, eds. (31 July 2013). Modern Middle East Authoritarianism: Roots, Ramifications, and Crisis. Routledge. p. 168. ISBN 9781135007317. ^ "Ayatollah Khomeini (1900–1989)". BBC – History. Retrieved 20 June 2013. ^ a b Reich, Bernard (1990). Political Leaders of the Contemporary Middle East and North Africa: A Biographical Dictionary. Westport, CN: Greenwood Press. p. 310. ^ "NYU Law: A Guide to the Legal System of the Islamic Republic of Iran". Nyulawglobal.org. Retrieved 16 December 2011. ^ Ibrahim, Youssef M. (31 July 1988). "The world: Khomeini vs. Hussein; Mideast's Contenders for Nasser's Mantle". The New York Times. ^ a b "TIME Person of the Year 1979: Ayatullah Khomeini". Time. 7 January 1980. Retrieved 22 November 2008. ^ a b "IRAN SAYS AN ATTEMPTED COUP BY ARMY GROUP WAS FOILED". The New York Times. 28 June 1982. ^ "The Mystic Who Lit The Fires of Hatred. 7 January 1980". Time. 7 January 1980. Retrieved 19 March 2010. ^ Katz, Mark N. (2010). "Iran and Russia". In Wright, Robin B. The Iran Primer: Power, Politics, and U.S. Policy. United States Institute of Peace. p. 186. ISBN 978-1-60127-084-9. ^ a b Lamb, Christina (2001-02-04). "Khomeini fatwa 'led to killing of 30,000 in Iran'". The Telegraph. Retrieved 2017-06-23. ^ Karsh, Efraim (25 April 2002). The Iran–Iraq War: 1980–1988. Osprey Publishing. pp. 1–8, 12–16, 19–82. ISBN 978-1841763712. ^ "A list of executed prisoners in 1988 (in Farsi)" (PDF). ^ "Iran Human Rights Documentation Center – A Faith Denied: The Persecution of the Baha'is of Iran". Iranhrdc.org. Retrieved 9 March 2012. ^ Paul Vallely (19 February 2014). "The vicious schism between Sunni and Shia has been poisoning Islam for 1,400 years – and it's getting worse". The Independent. London. Retrieved 2 March 2014. ^ Persian Mirrors: The Elusive Face of Iran, Elaine Sciolino|quote="Those intellectuals who say that the clergy should leave politics and go back to the mosque speak on behalf of Satan." ^ Gölz, "Khomeini's Face is in the Moon: Limitations of Sacredness and the Origins of Sovereignty. ", In Sakralität und Heldentum. Edited by Felix Heinzer, Jörn Leonhard and von den Hoff, Ralf, 229–44. Helden – Heroisierungen – Heroismen 6. Würzburg: Ergon, 2017, p. 230. ^ "BBC: Historic Figures: Ayatollah Khomeini (1900–1989)". BBC. 4 June 1989. Retrieved 19 March 2011. ^ a b "Ruhollah Khomeini". Encyclopedia Britannica. ^ "Iran arrests 11 over SMS Khomeini insults". GlobalPost. Archived from the original on 14 March 2016. ^ "Iran arrests 11 over SMS Khomeini insults: report". The Daily Star. 22 September 2017. Retrieved 4 February 2017. ^ a b "Historic Personalities of Iran: Ayatollah Khomeini". Iranchamber.com. Retrieved 5 January 2013. ^ writer, staff. "Imam Khomeini's Biography". ^ Moin, Baqer. Khomeini: Life of the Ayatollah. I.B. Tauris; Reprint edition (July 15, 2009). ISBN 978-1-84511-790-0. ^ Brumberg 2001, p. 45. "By 1920, the year Khomeini moved to Arak..."
^ Moin 2000, p. 28. "Khomeini's madraseh in Qom was known as the Dar al-Shafa..."
^ a b "Philosophy as Viewed by Ruhollah Khomeini". Imamreza.net. Archived from the original on 14 June 2011. Retrieved 19 March 2010. ^ "BBC – History – Ayatollah Khomeini (1900–1989)". BBC. 4 June 1989. Retrieved 19 March 2010. ^ a b Encyclopædia Britannica. "Ruhollah Khomeini – Britannica Online Encyclopedia". Britannica.com. Retrieved 19 March 2010. ^ "Kashf al-Asrar". Gemsofislamism.tripod.com. Retrieved 19 March 2010. ^ "Encyclopedia of World Biography on Ruhollah Musavi Khomeini, Ayatullah". Bookrags.com. Retrieved 19 March 2010. ^ Khomeini, Ruhollah (1981). Islam and Revolution : Writing and Declarations of Imam Khomeini. Translated and Annotated by Hamid Algar,. Berkeley: Mizan Press. p. 172. ^ "Encyclopedia of World Biography on Ruhollah Musavi Khomeini, Ayatollah". Bookrags.com. Retrieved 19 March 2010. ^ "Moin, Khomeini". 2000. p. 104. ^ Vakili Zad, Cyrus (Spring 1990). "Organization, Leadership and Revolution: Religiously-Oriented Opposition in the Iranian Revolution of 1978–1979". Conflict Quarterly: 5–25. Retrieved 13 February 2013. ^ Hiro, Dilip. Iran Under the Ayatollahs (Routledge Revivals). Routledge; 1 edition (February 16, 2013). p. 48. ISBN 978-0-415-66969-6. ^ "The Unknown Ayatullah Khomeini – TIME". Time.com. 16 July 1979. Retrieved 19 March 2010. ^ Sciolino, Elaine (27 August 2000). "nyt.com The People's Shah". The New York Times. Retrieved 19 March 2010. ^ Fisk, Robert (2005). The great war for civilisation : the conquest of the Middle East. New York: Vintage Books. p. 162. ISBN 1400075173. ^ Islam and Revolution (1981), pp. 29–30. ^ Islam and Revolution (1981), p. 59. ^ Islam and Revolution (1981), p. 54. ^ Taheri, The Spirit of Allah, p. 238, see also Gölz, "Khomeini's Face is in the Moon: Limitations of Sacredness and the Origins of Sovereignty. ", In Sakralität und Heldentum. Edited by Felix Heinzer, Jörn Leonhard and von den Hoff, Ralf, 229–44. Helden – Heroisierungen – Heroismen 6. Würzburg: Ergon, 2017, p. 229-244..
^ "On This Day, 1 February. 1979: Exiled Ayatollah Khomeini returns to Iran". BBC News. ^ a b Jerome, Carole (1 September 1980). "Back to the Veil". New Internationalist (091). Retrieved 3 August 2013. ^ a b "12 Bahman: Khomeini Returns". Frontline. PBS. 1 February 2009. Retrieved 4 August 2013. ^ Niki Baraha (2011). Unpaved Road: An Iranian Girl's Real Life Story of Struggle, Deception and Breaking the Rules. iUniverse. ^ a b Elaine Sciolino (25 September 2001). Persian Mirrors: The Elusive Face of Iran. Simon and Schuster. p. 55. ISBN 978-0-7432-1779-8. Retrieved 30 July 2013. ^ Axworthy, Michael (2007). Iran: Empire of the Mind: A History from Zoroaster to the Present Day. London: Penguin. pp. 265–6. ISBN 014103629X. ^ "امروز در آینه تاریخ". Aviny. Archived from the original on 18 February 2006. Retrieved 19 March 2010. ^ "World: Middle East Analysis: The forces for change". BBC News. 2 February 1999. Retrieved 19 March 2010. ^ "Khomeini's REVERSALS of Promises". Gemsofislamism.tripod.com. Retrieved 19 March 2010. ^ "Omar Sial: A Guide to the Legal System of the Islamic Republic of Iran". Nyulawglobal.org. Retrieved 19 March 2010. ^ "A Detailed Analysis of Iran's Constitution, by Richard Horowitz, World Policy Institute Blog, 12 October 2010". ^ Swenson Elmer. "Khomeini's REVERSALS of Promises (although not an academic research, this article contains a handful of reliable references)". tripod.com. ^ "THE IRANIAN: Khomeini before & after revolution". iranian.com. ^ a b ""Inside Iran", Maziar Bahari, Published 11 September 2008". Newstatesman.com. Retrieved 19 March 2010. ^ Smith, William E. (14 June 1982). "The $150 Billion Question". Time. Retrieved 19 March 2010. ^ John Pike. "The Iran–Iraq War: Strategy of Stalemate". Globalsecurity.org. Retrieved 19 March 2010. ^ Rummel, Rudolph. "Power Kills". hawaii.edu. ^ Mohammadi, Kamin (7 May 2012). "The Cypress Tree". A&C Black – via Google Books. ^ a b Carol, Steven (25 August 2015). "Understanding the Volatile and Dangerous Middle East: A Comprehensive Analysis". iUniverse – via Google Books. ^ SHANE HARRIS, MATTHEW M. AID. "Exclusive: CIA Files Prove America Helped Saddam as He Gassed Iran". ForeignPolicy.com. Retrieved 27 August 2013. ^ Porter, Gareth (16 October 2014). "When the Ayatollah Said No to Nukes". Foreign Policy. Retrieved 21 August 2015. ^ Woo, Richard (2011). God Or Allah, Truth Or Bull?. Strategic Book Publishing. pp. 10. ISBN 978-1-60976-813-3. ^ "Rushdie regrets". The New York Times. 19 February 1989. Retrieved 5 January 2013. ^ ""Japanese Translator of Rushdie Book Found Slain"". Archived from the original on 2 June 2002. Retrieved 16 October 2010. CS1 maint: BOT: original-url status unknown (link), WEISMAN, Steven R. The New York Times, 13 July 1991. ^ John Pike. "Gobal Security, Intelligence: Niruyeh Moghavemat Basij – Mobilisation Resistance Force". Globalsecurity.org. Retrieved 19 March 2010. ^ "Secretariat of the Supreme Council of the Cultural Revolution. Brief history of the SCCR". Iranculture.org. Archived from the original on 30 December 2007. Retrieved 19 March 2010. ^ a b Sorenson, David S (24 December 2007). An Introduction to the Modern Middle East, By David S. Sorenson. Google Books. ISBN 978-0-8133-4399-0. Retrieved 19 March 2010. ^ Maloney, Suzanne (c. 2010). "The Iran Primer. The Revolutionary Economy". United States Institute of Peace. Retrieved 3 December 2015. ^ Harrison, Frances (8 January 2007). "Huge cost of Iranian brain drain By Frances Harrison". BBC News. Retrieved 19 March 2010. ^ "Democracy? I meant theocracy By Dr. Jalal Matini". Iranian.com. 5 August 2003. Retrieved 19 March 2010. ^ WOODWARD, BOB (19 November 1986). "CIA Support for Exiles, Other Covert Iran Activity Reported" – via LA Times. ^ "Massacre 1988 (Pdf)" (PDF). Retrieved 19 March 2010. ^ "Memories of a slaughter in Iran". Iranfocus.com. 5 September 2004. Retrieved 19 March 2010. ^ The Millimeter Revolution By ELIZABETH RUBIN . ^ "IRAN: Life of Jews Living in Iran". Sephardicstudies.org. Retrieved 19 March 2010. ^ Manou & associates Inc. SW Department. "Iran Fact Sheet". Iranonline.com. Retrieved 18 August 2014. ^ "A Faith Denied: The Persecution of the Baha'is of Iran" (PDF). Iran Human Rights Documentation Center. 2007. Archived from the original (PDF) on 27 November 2007. Retrieved 6 October 2007. ^ "U.S. Jews Hold Talks With Khomeini Aide on Outlook for Rights". The New York Times. 13 February 1979. ^ Kayhan International, May 30, 1983; see also Firuz Kazemzadeh, 'The Terror Facing the Baha'is' New York Review of Books, 1982, 29 (8): 43–44. ^ "Sarasota Herald-Tribune – Google News Archive Search". ^ "Largest percentage of population to attend a funeral | Guinness World Records". guinnessworldrecords.com. Retrieved 25 August 2015. ^ Moseley, Ray (7 June 1989). "Mourners Rip Shroud, Khomeini`s Body Falls – Chicago Tribune". Articles.chicagotribune.com. Retrieved 2 March 2014. ^ "Iranians – Introduction, Location, Language, Folklore, Religion, Major holidays, Rites of passage, Relationships, Living conditions". Every Culture. Retrieved 19 March 2010. ^ Keddie, Nikki R.; Yann Richard (2003). Modern Iran: Roots and Results of Revolution. New Haven, Connecticut: Yale University Press. p. 260. ISBN 978-0-300-09856-3. ^ Behnegarsoft.com. "الف - بخشنامه موسوي درباره عكس‌ منتظري/تصویر". alef.ir. Archived from the original on 26 December 2009. ^ The New Republic "Khamenei vs. Khomeini" by Ali Reza Eshraghi, 20 August 2009. Retrieved 20 August 2009. ^ a b The Failure of Political Islam by Olivier Roy, translated by Carol Volk Harvard University Press, 1994, p.173–74 quoted in "the vilayat-i faqih thesis was rejected by almost the entire dozen grand ayatollahs living in 1981"
^ "Ayatollah Khomeini and the Contemporary Debate on Freedom". Jis.oxfordjournals.org. 21 July 2006. doi:10.1093/jis/etl042. Retrieved 19 March 2010. ^ Dr. Jalal Matini, Translation & Introduction by Farhad Mafie (5 August 2003). "Democracy? I meant theocracy". Iranian.com. ^ "Iran president bans Western music". BBC News. 19 December 2005. Retrieved 19 March 2010. ^ "A Revolution Misunderstood. Charlotte Wiedemann". Qantara.de. Retrieved 19 March 2010. ^ ""Economics is for donkeys" Robert Tait. 11 September 2008". Newstatesman.com. 11 September 2008. Retrieved 19 March 2010. ^ Robert Tait, A fatwa for transsexuals Archived 6 June 2011 at the Wayback Machine, and a similar article on The Guardian. Gives details on Molkara's plea. ^ Kadri, Sadakat (2012). Heaven on Earth: A Journey Through Shari'a Law from the Deserts of Ancient Arabia ... Macmillan. p. 251. ISBN 9780099523277. ^ Tait, Robert (27 July 2005). "A fatwa for freedom". The Guardian. Retrieved 2 December 2015. ^ Taheri, Amir (1986). The spirit of Allah: Khomeini and the Islamic revolution (1st U.S ed.). Bethesda, Md. : Adler & Adler. ISBN 9780917561047. ^ fatwa No. 83 from A Clarification of Questions : An Unabridged Translation of Resaleh Towzih al-Masael, by Ayatollah Syed Ruhollah Moosavi Khomeini, Translated by J. Borujerdi, with a Foreword by Michael M. J. Fischer and Mehdi Abedi, Westview Press/ Boulder and London c1984, p.48. ^ "Sunni-Shia Unity, A lecture by Sheikh Ahmad Deedat". inminds.com. Retrieved 6 April 2012. ^ "Imam Khomeini Official Website | سایت امام خمینی". Imam-khomeini.ir. Retrieved 9 March 2012. ^ Fisk, Robert (5 June 1995). "Love the revolution, shame about reality". The Independent. London. Retrieved 19 March 2010. ^ a b "Khamenei vs. Khomeini" by Ali Reza Eshraghi, 20 August 2009. Retrieved 23 August 2009. ^ Grandchildren of the revolution. By von Najmeh Bozorgmehr and Roula Khalaf 04.03.2009 Archived 5 May 2009 at the Wayback Machine. Retrieved 23 August 2009. ^ Ledeen, Michael A. (6 January 2004). "Veiled Threats Lure Ayatollah's Grandson Home By Michael A. Ledeen, 6 January 2004". Aei.org. Archived from the original on 24 April 2009. Retrieved 19 March 2010. ^ PHILIP SHERWELL Published: 12:01 am BST 18 June 2006 (18 June 2006). "Ayatollah's grandson calls for US overthrow of Iran, By PHILIP SHERWELL 19 June 2006". The Daily Telegraph. London. Retrieved 19 March 2010. ^ "Khomeini grandson returns to poll, 13 February 2008". BBC News. 13 February 2008. Retrieved 19 March 2010. ^ "World: Middle East Ayatollah Khomeini on the Web". BBC News. 1 June 1998. Retrieved 19 March 2010. ^ "The Works and Declarations of Imam Khomeini". Imamreza.net. Archived from the original on 12 June 2010. Retrieved 19 March 2010. ^ "Forty Hadith, An Exposition, Second Revised Edition". Al-Islam.org. ^ "Adab as-Salat: The Disciplines of the Prayer Second Revised Edition". Al-Islam.org. Brumberg, Daniel (2001). Reinventing Khomeini: The Struggle for Reform in Iran. University of Chicago Press. ISBN 0-226-07758-6. Daniel, Elton L. (2001). The History of Iran. Greenwood Press. ISBN 0-313-30731-8. DeFronzo, James (2007). Revolutions And Revolutionary Movements. Westview Press. ISBN 0-8133-4354-2. Karsh, Efraim (2007). Islamic Imperialism: A History. Yale University Press. ISBN 0-300-12263-2. Khomeini, Ruhollah; Algar, Hamid (2002). Islamic Government: Governance of the Jurist. Alhoda UK. ISBN 964-335-499-7. Keddie, Nikkie R. (2003). Modern Iran: Roots and Results of Revolution. Yale University Press. ISBN 0-300-09856-1. Milani, Mohsen M. (1994). The Making of Iran's Islamic Revolution: From Monarchy to Islamic Republic. Westview Press. ISBN 0-8133-8476-1. Moin, Baqer (2000). Khomeini: Life of the Ayatollah. St. Martin's Press. ISBN 0-312-26490-9. Rāhnamā, 'Ali (1994). Pioneers of Islamic Revival. Macmillan. ISBN 1-85649-254-0. Reich, Bernard (1990). Political Leaders of the Contemporary Middle East and North Africa: A Biographical Dictionary. Greenwood Press. ISBN 0-313-26213-6. Bakhash, Shaul (1984). The Reign of the Ayatollahs : Iran and the Islamic Revolution. New York: Basic Books. Harney, Desmond (1998). The priest and the king : an eyewitness account of the Iranian revolution. I.B. Tauris. Khomeini, Ruhollah (1981). Algar, Hamid (translator and editor), ed. Islam and Revolution: Writing and Declarations of Imam Khomeini. Berkeley: Mizan Press. Khomeini, Ruhollah (1980). Sayings of the Ayatollah Khomeini : political, philosophical, social, and religious. Bantam. Mackey, Sandra (1996). The Iranians : Persia, Islam and the Soul of a Nation. Dutton. ISBN 0-525-94005-7. Molavi, Afshin (2005). The Soul of Iran: a Nation's Journey to Freedom. New York: Norton paperbacks. Schirazi, Asghar (1997). The Constitution of Iran. New York: Tauris. Wright, Robin (1989). In the Name of God : The Khomeini Decade. New York: Simon & Schuster. Wright, Robin (2000). The Last Revolution. New York: Knopf. Wikimedia Commons has media related to Ruhollah Khomeini.